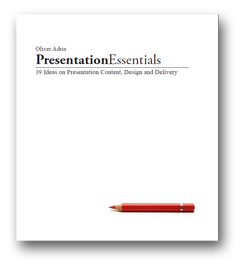 Oliver Adria has come up with a new e-book titled "Presentation Essentials - 39 Ideas on Presentation Content, Design and Delivery". His e-book consist of 5 parts. This 95 page e-book is a fast read. It also contains guest articles from two other presentation bloggers; Ellen Finkelstein & Andrew Abela). To find out more about the e-book click here. The e-book is priced at $ 19.95. You can read 2 sample articles from the e-book by clicking here.